Two-thirds (68%) of Latino internet users say they use Facebook, Twitter or other social networking sites, according to the Pew Hispanic Center survey. By comparison, 58% of all U.S. internet users say they use Facebook, Twitter or other social networking sites (Pew Research Center for the People & the Press, 2012a). 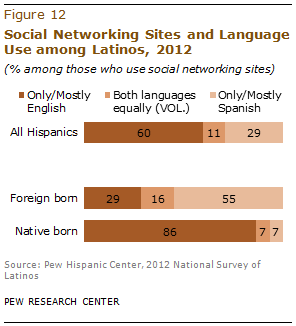 Who among Latinos Online Uses Social Networking Sites? Just as with other technologies, use of social media varies across subgroups of Latino internet users. Latinos ages 18 to 29 are most likely to say they use social media sites—84% say they do. By contrast, those ages 65 and older are the least likely to use social media sites—just 27% say they do this. Other differences across demographic subgroups are present. Native-born Hispanics are more likely than foreign-born Hispanics to use social networking sites—73% versus 63%. English-dominant Hispanics are more likely than bilingual Hispanics or Spanish-dominant Hispanics to use social media sites—76% versus 67% and 61% respectively. Educational attainment is also linked to use of social networking sites like Facebook and Twitter. Hispanics with a high school diploma (72%) or some college experience (73%) are more likely than those with no high school diploma (54%) to say they use social media. Among Latino internet users, those who use social networking sites like Facebook and Twitter are more likely than those who do not to be U.S. born—54% versus 43%. Latino social media users are also more likely than Latinos who do not use social media to be English dominant—34% versus 23%. On the flipside, Latino social media users are less likely than those who do not use social media to be Spanish dominant—25% versus 34%. Educational attainment is also correlated with social media use. Among Hispanic internet users who use social networking sites, 44% have some college experience. By contrast, among Hispanic internet users who do not use social networking sites, 36% have some college experience. English is the language most used among Hispanics who use social networking sites like Facebook or Twitter. According to the Pew Hispanic survey, most Hispanic social media users (60%) say they mostly or only use English. An additional 29% say that when they use social networking sites, they do so only or mostly in Spanish. And 11% say they use both English and Spanish equally when using social networking sites. Foreign-born Latinos make up 46% of all Latino social networking site users. Among them, more than half (55%) say they mostly or only use Spanish when posting Facebook updates or tweets. By contrast, among U.S.-born Latino social networking site users, 86% say they mostly or only use English when engaging with social media.